24 Feb. 25 June. 25 Oct. The order of psalmody for the Day-Hours being now arranged, let all the remaining 25 Psalms be equally distributed among the seven Night Offices, dividing the longer Psalms among them, and assigning twelve to each night. Above all, we recommend that if this arrangement of the Psalms be displeasing to anyone, he should, if he think fit, order it otherwise; taking care in any case that the whole Psalter of a hundred and fifty Psalms be recited every week, and always begun afresh at the Night Office on Sunday. For those monks would shew themselves very slothful in the divine service who said in the course of a week less than the entire Psalter, with the usual canticles; since we read that our holy fathers resolutely performed in a single day what I pray we tepid monks may achieve in a whole week. With this section of Chapter XVIII, our father Saint Benedict completes his distribution of the 150 psalms over the course of the week. This being done, he shows his profound humility and reasonableness by allowing for a different arrangement of the psalms, but under one condition only: that the whole Psalter of a hundred and fifty Psalms be recited every week, and always begun afresh at the Night Office on Sunday. So clear is Saint Benedict on this particular point, that one cannot depart from the principle of the recitation of the whole Psalter of one hundred and fifty psalms over the week, without stepping outside the margins of the Holy Rule. The distribution of the Psalter over one week is one of the very few non-negotiables laid down by Saint Benedict. Why is Saint Benedict so insistent on this principle? He explains: “Those monks would shew themselves very slothful in the divine service who said in the course of a week less than the entire Psalter, with the usual canticles; since we read that our holy fathers resolutely performed in a single day what I pray we tepid monks may achieve in a whole week.” It is clear, then, that Benedictines are bound to pray the Psalter in its entirety weekly. One can hardly contest a principle so clearly laid down. This being said, in our monastery’s ten years of existence, we have learned, and sometimes learned rather painfully, that everything cannot be undertaken all at once. Building the full liturgical life of a monastery is like laying the foundations of an edifice and, then, slowly and carefully building the walls, cementing in one stone at a time until, the walls having reached their full height, it becomes possible to construct the roof and cover it with tiles. 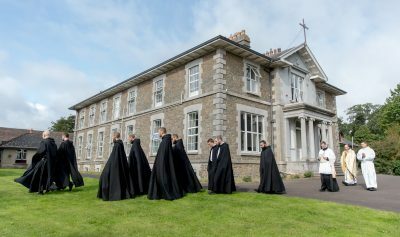 In the first years, we attempted to carry out the full choral servitutus pensum [obligation of divine service], and did so with energy and determination. One of the monastery’s oldest friends, Dr Tracy Loper, used to rise early and, before going off to his medical practice, join us at 5:00 a.m. for the recitation of Matins. After some years, given the frequent occurrences of illness, the challenges of life in a new climate, and the growing acceptance of our human limitations, I found it necessary to suspend the Night Office for a time, and this in accord with the provisions of our Declarations and Statutes, bearing in mind, as Saint Benedict says, the discretion of holy Jacob, when he said “If I cause my flocks to be overdriven, they will all perish in one day.” At no time may an abbot put aside Saint Benedict’s injunction to “temper all things, that the strong may have something to strive after, and the weak nothing at which to take alarm.” An abbot may, at certain seasons and hours of his monastery’s life, be obliged to suspend observances that are, at least momentarily, beyond what the brethren can reasonably undertake. He does this, however, without losing sight of the integral observance and of the full servitutis pensum, which remain the ideal towards which we are constantly progressing. I shall always follow the wise advice of the Father Abbot who visited us from France some years ago. When I asked his counsel with regard to giving dispensations from choir, he was quick to reply that such dispensations should be given generously and as needed, lest any brother fall into weariness or discouragement. At the same time, I am bound to encourage a manly generosity and the spirit of sacrifice that manifests itself chiefly in . . . getting out of bed for Matins! You will all discover, each one for himself, that in spite of the hardship of rising for Matins or, perhaps, because of it, there are graces given at this Hour that are given at no other time. You will taste and see! Wonderful benefits accrue from the weekly repetition of the Psalter: the psalms become familiar, sometimes to the point of being memorised; the taste of them lingers for a long time on the palate of the soul; they become the ground of an authentic Christian contemplation, for by them, the prayer of Christ passes into us, and we pass into His prayer to the Father. Once the Night Office is firmly in place, we shall begin increasing the hours of adoration. But this, dear sons, will be the subject of another chapter. What a wonderful way of describing the benefits of the weekly psalter; thank you Father! Going from the four-week psalter to the weekly made a big difference in my life.